Indoor Pool, Hot Tub, Fireplaces, Golf, Park-like setting. Family Reunion Place! Beautiful, executive home with 3 levels, living room, conference/large dining room (seats 24) , small dining room (seats 6-8), theater/billiard room, huge indoor swimming pool and outdoor hot tub, 8 private sleeping rooms + 2 common sleeping areas (10 sleeping areas total) and 7 bathrooms. Beds/sofa beds to sleep 34 people. Extra portable bedding for a total of up 40 people for larger family reunions and certain group situations - contact owner for details. Exceptional for family reunions and retreats. We are situated on nearly six park-like acres. Field large enough for the team sport of your choice. Owners maintain an apartment on the north side of the building. We will not disturb your enjoyment of the property (in fact you probably will not see us) but we are there to maintain the pool and the property and to answer any questions and address any issues that may arise. Think of us as your personal concierge during your stay! Note: For reservations through August 2019 there is one additional bedroom and 1 additional bathroom available for our guests. (11 BR/Sleeping Areas total and 9Baths total). Starting in September 2019 these two rooms will no longer be available. Ted is a former management consultant and Director with Ernst & Young focusing on information technology related projects. Ted also worked for Price Waterhouse during his management consulting career. Ted is a graduate of Ball State University with a B.S. is Telecommunications and a Business Administration Minor. In addition to directing activities at the Inn, Ted and daughter Kiera - an Indiana University graduate - operate Uncharted Pixels LLC - a web services, branding, and video production services company. Ted is also a private pilot. Debbie manages the housekeeping functions making sure the home is up to her exacting standards of cleanliness and comfort. She was awarded the Hoosier Hospitality award by Indiana's Lieutenant Governor! Debbie attended Indiana University East in Richmond and has worked in the healthcare, childcare, and social services fields during her career. After living near Chicago, St. Louis, San Francisco, Los Angeles, and Cincinnati, We purchased this property to get back to our Hoosier roots near the Whitewater River valley. Both Ted and Debbie were born in Richmond just 25 minutes south of the property. Winchester is a great little town brimming with family values, lots of churches, nearby shopping, and close to our family. With six park-like acres, 3 fireplaces, and an indoor pool and outdoor hot tub, a conference room that seats 24, separate formal dining room that seats 8, a nice patio with seating for large groups, outdoor fire pit, and nearly 6 park-like acres, this property has everything you are looking for in a family reunion or retreat destination!. This home has something for everyone!. The older folks can sit by the living room fire or on the patio and have great conversation while the kids enjoy the pool or the theater/game room. 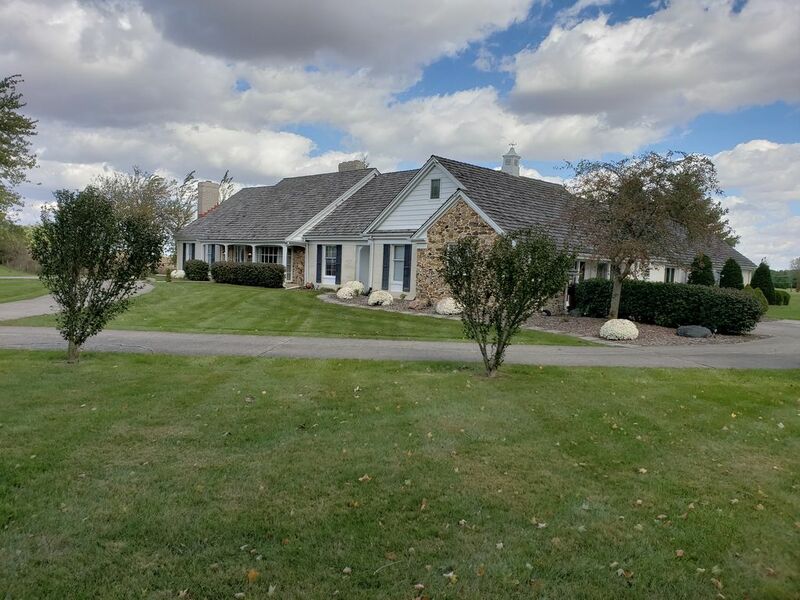 The teenagers can play volleyball and badminton on the east lawn while the guys head over to the award winning 27 hole golf course and the ladies go antique shopping. We have a game closet filled with board games and playing cards. Free WIFI is available throughout the property and most rooms have 4K or HDTVs with HDMI connections. The winery tours are a great option with live entertainment on some summer evenings. Nearby Camp Yale offers a rock climbing tower and zip line as well as a low ropes course. Fishing is available in nearby Farmland, Richmond, and Muncie. The historic Winchester Speedway "the worlds fastest half mile" is 10 minutes away offering pulse pounding high banked auto racing and Eldora Speedway (about 45 minutes) offers awesome dirt track racing in the summer. Take a day and enjoy the Antique Alley trails for great shopping and don't forget to stop by Silvertowne for a unique gift shopping experience in Winchester. But you may never want to leave the property. This is truly a great family home with all we have to offer on the premises! Perfect for reunions and large family gatherings. Check out our ratings by our valued guests! Concierge either on-property or available via phone/text. Most bedrooms have en-suite private baths. (Rooms 5A and 5B use the bathroom for #5, 7A and 7b uses the bathroom for 7 (2 bedroom apartment). Two dryers one gas one electric. Gas fireplace in Living Room, Wood Burning Fireplace in Conference/Dining Room, Gas Fireplace in Library, 2 Electric Fireplaces. Large living room with leather seating and 80" HDTV with DVD Player. Large Jenn Air Double Oven. Small Toaster Oven. Automatic drip and keureg-like pods. Dishes, cups, mugs, saucers, knives, forks, spoons, all manner of kitchen utensils. Large dining/conference table seats 20. Additional table in same room seats 4. Smaller dining room seats 6-8 Patio seating off kitchen. Live TV provided via HULU streaming on HDTVs. , HDTVs in Living Room, Conference room, most bedrooms, Projector HDTV in Billiard/Game Room. HDTV programming via Hulu, on most TVs. HULU streaming Live TV and free movies in most guest rooms as well as the theatre room and Executive Suite Living Room. Library room (#6) has several books available. Billiard table, dart board, table shuffleboard, seating for card play, golf putting, shuffleboard table. Large collection of board and card games available. Located in upstairs closed market "Game Closet"
Some toys for small children. Volleyball, badminton, and croquet sets available. Golf putters and balls in game room. Limited Selection Recommend you bring your own. Award winning 27 hole Winchester Golf Club golf course 1/2 mile. Very accommodating owners for the property. Pool area was fantastic and so handy for the kids to swim whenever they wanted. Lots of space in this home for individual activities. Was really nice to be able to seat all 19 of us at the table for Thanksgiving. Only 2 mi to Walmart Would recommend this property! This is the second time I've taken my group to Ted's home in Winchester. I would highly recommend it! We have had two great years here and it is perfect for our large group. There is a ton to do indoors which is helpful for our trip in the fall when the weather isn't great. Ted has been a very gracious host both times we have stayed. Don't miss out on this property! Wonderful Home for a Family Reunion! Over Labor Day weekend we had a family reunion with family from Michigan and Ohio. Winchester, Indiana was an ideal meeting place in the middle. Fun was had by all from the little ones to the adults. The indoor pool was a big hit! Our family also enjoyed the hot tub, fire pit and outdoor games. One treat was that the dining room table was large enough for us all to eat together! Ted was awesome answering our questions and problem solving when needed. We hope to return again! We were delighted that this family had such a memorable and fun time at our place. Family Reunions are what this property was set up for! Lots to do on property for all age groups rain or shine! Family togetherness at meals and at play. We strive to make each reunion experience a great one by providing virtually everything you need and addressing your questions quickly and efficiently. We love our families and look forward to serving this family again soon! Our family of 26 people stayed for 3 nights and we celebrated our daughter's 16th birthday. The owners were very nice and fixed small issues within no time when we called them. And they have agreed for extra members to join an evening party, Overall, it's great experience and no complaints from any of the family members. Kids enjoyed the pool and Jacuzzi very much. I recommend to others. We were very happy to see this guests review and are always delighted to exceed expectations! Recommendations from familes to their friends are our favorite way to receive new bookings! Thanks so much for your wonderful review! Winchester is a quaint town of just under 5000 people with a beautifully restored courthouse square with shopping and a 3 screen theatre. Within 30 minutes you can see Broadway shows, enjoy two symphony orchestras, ride a zip line, see an Egyptian mummy, golf on several beautiful golf courses, visit a beautiful cultural center and gardens, visit several excellent museums, go antiques shopping on two antique alley trails, go lake fishing, clear water snorkeling/scuba diving, snow tubing, and much more! Rates are subject to change until the reservation is confirmed and initial payment has been made. Renter must agree to the terms of the rental agreement. Renter must put an accurate estimate of the total number of persons age 2 and older who will be occupying the property in order to accurately calculate the total rental amount. For groups of more than 10 persons an additional fee of $12 per person per night + tax is charged to offset the cost of additional laundry, pool chemicals, and property maintenance.